YOUNGSTOWN, Ohio — Having a mobile app allows organizations to have a direct line to users’ pockets, providing them the information they want as soon as they need it. Whether it’s to find a book at the library or a space for a public art project, people and organizations throughout the region have taken to apps to better connect with clients. The Public Library of Youngstown & Mahoning County launched its first app in 2010. It was essentially a mobile version of the library website, developed for a time before websites were optimized for mobile devices. Last fall, the library launched a new app, PLYMC Mobile, which took away some features but refined those that stayed, namely the catalogue search. Loew was part of the team that worked with BiblioCommons to develop and customize the app for the library. The developer has worked with many of the country’s largest library systems, including the Boston Public Library, Chicago Public Library and Palo Alto City Library. While the basic service is the same for all, libraries do have options to tweak their own app, such as the Public Library’s focus on its catalogue. “As we watched statistics over the years to make sure we had what people wanted, the catalogue was the most-used feature,” Loew says. While it’s not like wandering through a library to see what books you’ll stumble upon, she acknowledges that there isn’t always the time. One of the biggest changes between the first app and the current one is the immediate updates to the catalogue. Before, staff would have to send weekly updates to the developer, who would then update the in-app catalogue. “This [new app] is directly linked to our catalogue, so there’s no time lag. As soon as it comes in and is processed, it’s in the app,” she says, adding that users can also see what books the library has ordered and when they’re expected to arrive. Also available are pick lists created by library staff and access to two e-books services used by the Public Library, Overdrive and Hoopla. For Youngstown State University student Lorinda Dixon-Guerrieri, a mobile app seemed the best way to put together a comprehensive list of spaces available for public art in Liberty Township. 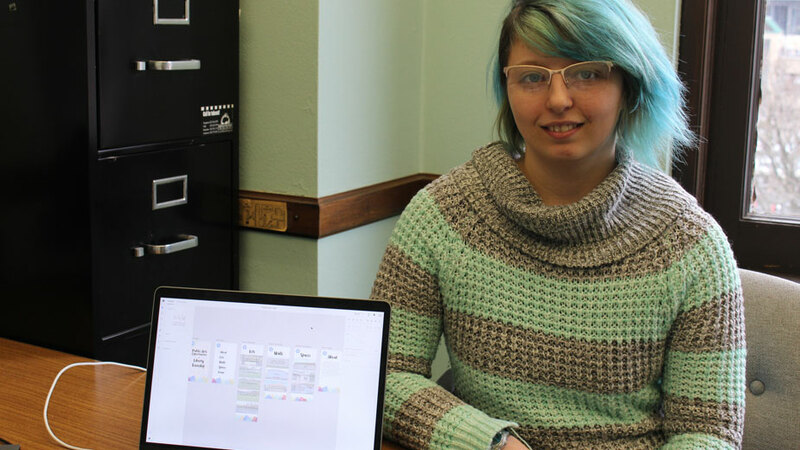 As part of the interactive graphic design course at YSU, she’s spent the semester working on her app, designing it from the ground up in Adobe XD. Lorinda Dixon-Guerrieri developed an app highlighting public art spaces in Liberty. She scouted the sites herself, finding walls that could be covered in murals, greenspaces that could be turned into pocket parks and buildings that could house art galleries or studios. While the app isn’t incredibly complex, it doesn’t need to be, she says. Creating an app in Adobe XD is no harder than putting together a flow chart, setting the destination of what each tap of your phone takes you to. Not all projects are so simple. Before the Western Reserve Transit Authority launched its MyStop app, director of transportation Judy Rodriguez says the agency spent months plotting the exact coordinates of each bus stop in order to have the app’s GPS function work properly. The process took about 18 months, she says. But having that function and the others that tie into it, she says, are crucial. The app was developed by State College, Pa.,-based Avail Technologies, a firm dedicated to making apps for public-transit organizations across the country. Among its other clients are those in national parks in Maine and New Mexico and the Akron Metro Regional Transit Authority. MyStop allows users to not only see where buses are in real time, but also detours, how many people are on a bus and plan trips. One of the most well received features, Rodriguez says, is the alert system. Scheduling has also proven a popular tool for users of the YMCA of Youngstown’s app, says Marykaye Carlson, director of development and marketing. Since launching the app in 2014, the schedule for classes and facility availability has been the most-used feature. “They want to know if the pool is available for lap swim or maybe what time a class is because they’re off early one day,” she says. When the Y first looked into adding an app, she says, the organization found that some 70% of members viewed its e-newsletter on their mobile phones. “Knowing that the mobile experience is that popular, it made so much sense to have an app that’s updated,” Carlson says. In addition to providing schedules, the app also allows for push notifications, sending alerts directly to phones, which also makes things easier for staff, she says. Pictured above: The Public Library of Youngstown & Mahoning County launched a revamped app last year.